There’s a reason celebrities whiten their teeth: it makes them look younger and feel more beautiful. But you don’t have to be a celebrity to have a brighter smile with today’s modern tooth whitening systems. Teeth can become dingy or discolored from years of tobacco use, or the foods you eat or drink—stains from foods can be caused by tomatoes, curry and berries, and in drinks from tea and coffee, red wine, and even cola. But the good news is that these stains can be removed with a tooth whitening system, restoring your teeth to a whiter appearance. In addition to staining, the color of teeth is related to the thickness of your enamel. When enamel becomes thin, the yellowish-brown tint of the natural dentin within the tooth can show through. Enamel can thin with age, or can wear away from chewing or exposure to acidic foods and drinks. Other causes of discolored teeth include tetracycline antibiotics, too much fluoride, or physical trauma to the tooth that damages the tooth interior. There are a number of over-the-counter tooth whitening remedies, including whitening toothpastes and tooth polishes, gels and whitestrips. Whitening toothpastes (dentifrices) have very little impact on whitening, generally only removing surface stains and whitening one shade lighter through physical abrasion not chemical reaction. Look for those carrying the American Dental Association (ADA) Seal of Acceptance. If you have more severe stains, whitening products containing hydrogen peroxide bleaching agents may help. These over-the-counter and dentist-dispensed home-use bleaches contain approximately 10% carbamide peroxide, which yields approximately 3.5% hydrogen peroxide. According to an ADA report on safety and effectiveness of tooth whitening products, these should be used following a consultation with a dentist, especially if you have many fillings, crowns or extremely dark stains. Your dentist will recommend the right course of treatment. To remove discoloration from tobacco or food stains, EverSmile Dentistry using the Opalescence tooth whitening system. Using the gentle, non-acidic cleansing of carbamide peroxide, the oxidation process removes stains from the outer layer of teeth enamel. Opalescence also contains fluoride, which aids in strengthening teeth. 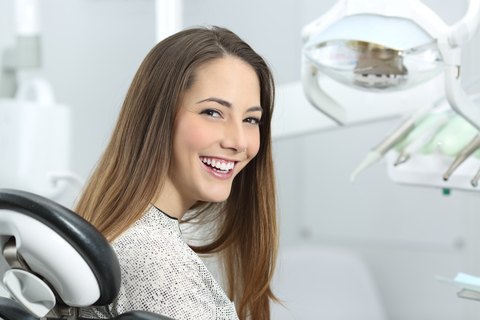 We first create custom-fitted molds from impressions of your upper and lower teeth in order to fashion thin and flexible bleach holders, called trays. Once those are created, you come back in to have them fitted. There we provide you with the Opalescence tooth whitening gel and instructions for home whitening. Users see a gradual whitening over a two-week period, then only periodic touch ups are required after that—about every six months. Since professional whitening products contain concentrations of carbamide peroxide ranging from 10 to 40 percent, some patients experience slight tooth sensitivity or gum irritation when using the whitening product. This is temporary and should abate once treatment is completed. Long-term continual and unsupervised use of whitening products is not recommended. In addition, the usage of opalescence is preferred due to its anti-sensitivity agent during the whitening process. This is the reason the professional opalescence tooth whitening system is recommended over the OTC products. To help prevent stains from reattaching, limit the consumption of products that cause staining, and rinse the mouth out after consuming them. And stop smoking! To learn more about the Opalescence tooth whitening system, contact EverSmile Dentistry, located in Sterling, Virginia. We’ll be glad to explain how it works and see if it is the best option to restore your brighter, whiter smile.